Recorder playing involves breath, fingers, tongue, ears, eyes. And the heart. We detail each in turn. Your breath makes the recorder sound. All recorder music, good and bad, comes from blown air. Likewise for any wind instruments, of course, however breath for the recorder is uniquely different. Instruments like flute, trumpet, saxophone have an "embouchure", a particular mouth shape needed to play the instrument. The recorder is different. All you do is blow into the mouthpiece, the inner workings make the sound. This is why children get noise from a recorder straight away, unlike other wind instruments. While there are particular ways to hold the recorder in your mouth, a specific embrouchure is not needed. The instrument does the work. Simple? Not quite. Each recorder note has an optimal breath pressure. The low notes are unstable if the breath pressure is too high, the high notes don't work if the breath pressure is too low. For any given note, raising the breath pressure also raises the pitch, sending the instrument out of tune. The recorder essentially needs a light but extremely steady air flow. Developing this takes much practice. The breath makes the sound, the fingers choose the notes. Most wind instruments have keys, the recorder just has holes, covered in various combinations to make the notes. This lack of moving parts means that reasonable quality plastic recorders can be mass produced at low cost. However for high quality hand made wooden recorders, cutting the holes just right and the subsequent fine adjustments to each one requires a master craftsman. Many recorder notes are "cross fingered", meaning some fingers go up while others go down when moving between adjacent notes. The left thumb covers a single hole on the back of the recorder, this hole is opened or "cracked" a small amount to get the high notes. Getting this opening just right is a major part of recorder technique. While the fingers make the notes, the tongue determines when they start and end. The tongue acts as a switch, turning the air on and off, likewise the notes. Even if you have never played, your tongue is skilled. Repeat the words "he shredded it", notice the tongue taps the top the mouth three times, in rapid succession. Your tongue already has key aspects of recorder technique under control. The recorder has a small dynamic range, any given note cannot be much louder or softer than it already is. The tongue steps in to help, variations in articulation, long, short, very short gives the appearance of a dynamic range. As a developing recorder player, you will become skilled at using your tongue to express your music. Music is sound, the ears receive it. Your ears tell what is right, what is not. Training your ears to discern music is an integral part of learning recorder. In particular, your ears determine how well you play with others. A key milestone for the recorder student is joining other players, often recorders, also piano, guitar, violin etc. Success with these endeavours depends on where the ears are focussed. Beginning players are usually absorbed in their own sound, this needs to change for successful group playing. Your ears should hear less of your instrument, more of the others. This is a skill to be developed. Some instruments, the harmonica for example, are based around improvised playing, without printed notation. 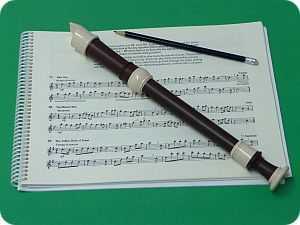 Recorder is different, almost all players read their parts. So, learning recorder also means learning to read music. Music enters through the eyes, is produced by breath, fingers and tongue, and is monitored by the ears. Paying close attention to music scores is a learned skill, likewise "sight reading", where an unknown piece on a printed page becomes music. Professional players usually have remarkable sight reading facility. The various tasks for breath, fingers, tongue, ears and eyes are mechanical ones, they combine to make recorder music. However there is more going on. Has music ever raised a prickle on the back of your neck? Emotions are being conveyed through the mechanical actions of playing. The heart is involved. As a beginning recorder student, I well remember encountering the works of Corelli. I felt a deep emotional connection to his music, despite how poorly I no doubt played it back then. I still feel the same way about his music, along with countless others since it first appeared, over three hundred years ago. Beginning players struggle with technique, with little else to consider. However as facility grows, technical challenges diminish. Your heart then more fully engages with your music. The recorder lessons on this site can get you there sooner.